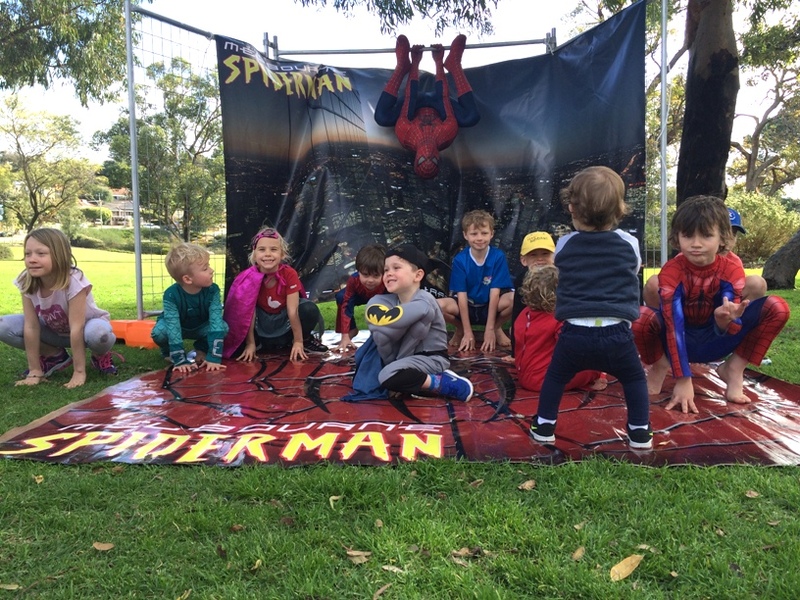 Kids Party Heroes Perth are your Perth superhero party specialists. Their Spiderman, Captain America, Batman & Iron Man (and now also Thor, The Hulk, Bumble Bee & Optimus Prime) characters are as close to the real thing as you are ever going to get right down to their accent. 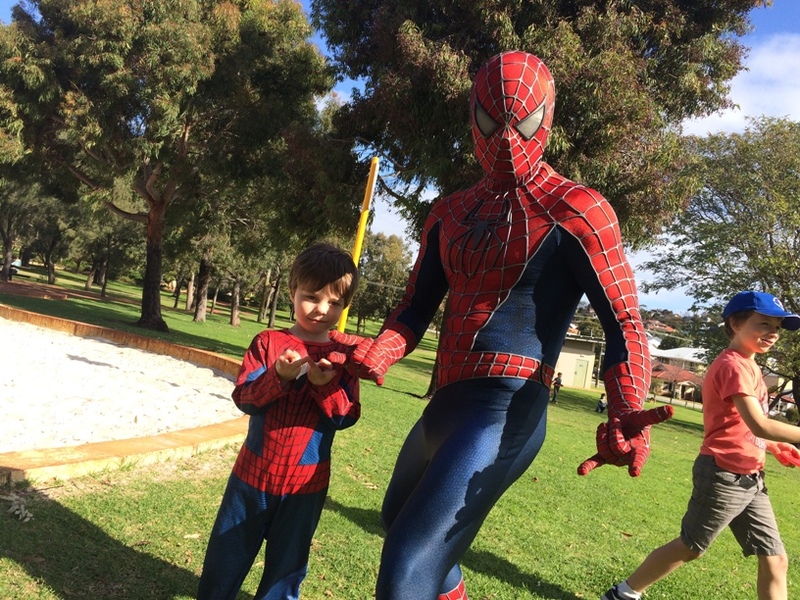 For Master 5's birthday we were lucky to get a visit from Spiderman himself at Millet Park Innaloo. There was some pretty excited faces and lots of screaming when they saw Spiderman running towards the party. 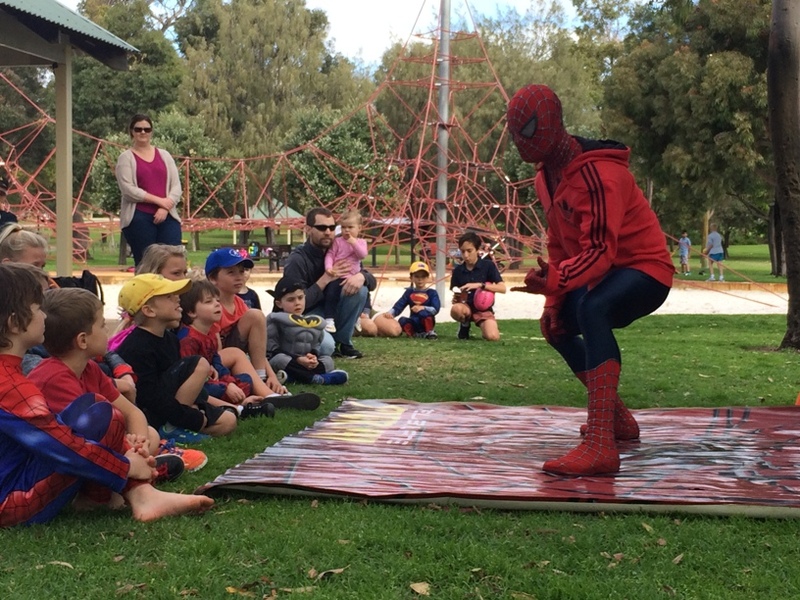 He quickly disappeared behind his stage, and when all the kids were sitting down, the sound track started and Spiderman reappeared to entertain all the boys and girls with his choreographed performance. 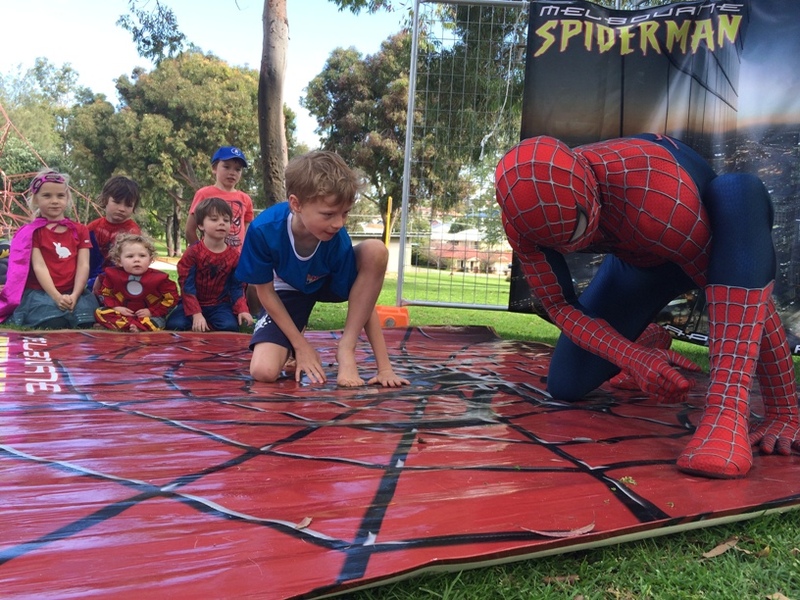 Spiderman did some dancing and took the kids through some of his signature moves then taught them a few of his dance moves with the birthday superhero of course getting lots of extra special attention. After this it was time to hang out with Spiderman. 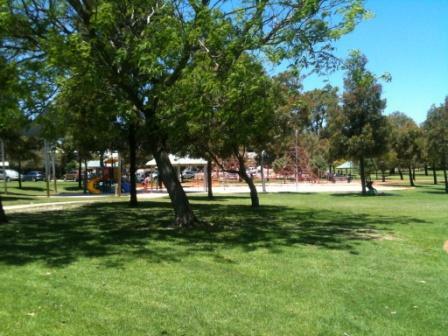 Millet Park Innaloo, also know as Spiderman Park by some, was a great place to hold our Superhero party, the kids had such fun climbing and hanging with the "real" Spiderman! It was lucky that Spiderman was there because the birthday boy climbed up the space net and couldn't get back down, so it was Spiderman to the rescue. Spiderman enjoyed climbing with the kids and was happy to take the time to get individual photos with all the kids (and the grown ups) and made his way through the guests introducing himself, as Spiderman of course, incase you didn't know who he was. He shook everyones hands, and you could feel the quality of his suit it was very rubbery! All Kids Party Heroes Perth suits are imported from overseas and of the highest quality and look exactly like the real thing. He talks, walks, climbs and moves just like the real Spiderman. 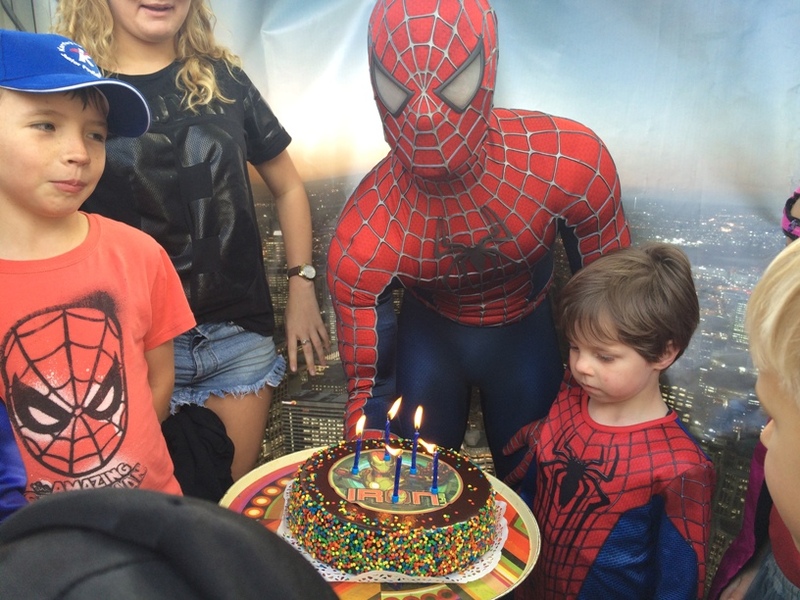 Of course it would be a Superhero party without Spiderman singing you happy birthday and helping you blow out the candles. His stage set up made a great barrier from the wind and as you can see made for some great photos. Spiderman hung with us for about an hour and the kids had such a great time climbing and talking with Spiderman. The guests (parents and kids) also got the opportunity for some amazing photos of their kids with Spiderman. It takes "Peter Parker" and his helper about 10-15mins to set up Spiderman's stage and another 10-15minutes to take it down and you need around 5m2 for the set up. When it was time to say goodbye, the birthday boy got a special goodbye from Spiderman - and we had one very happy 5 year old. 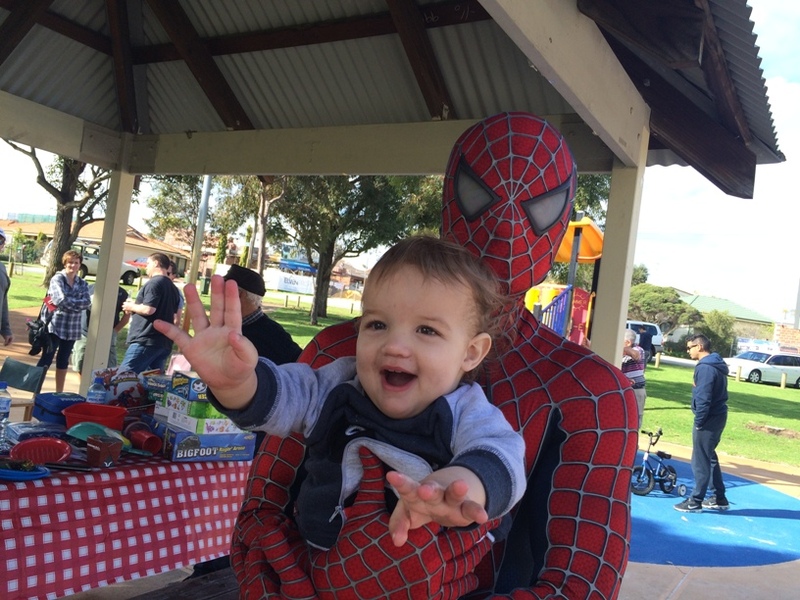 We received lots of facebook messages from friends with photos of their kids with Spiderman thanking us for an amazing party when we got home. 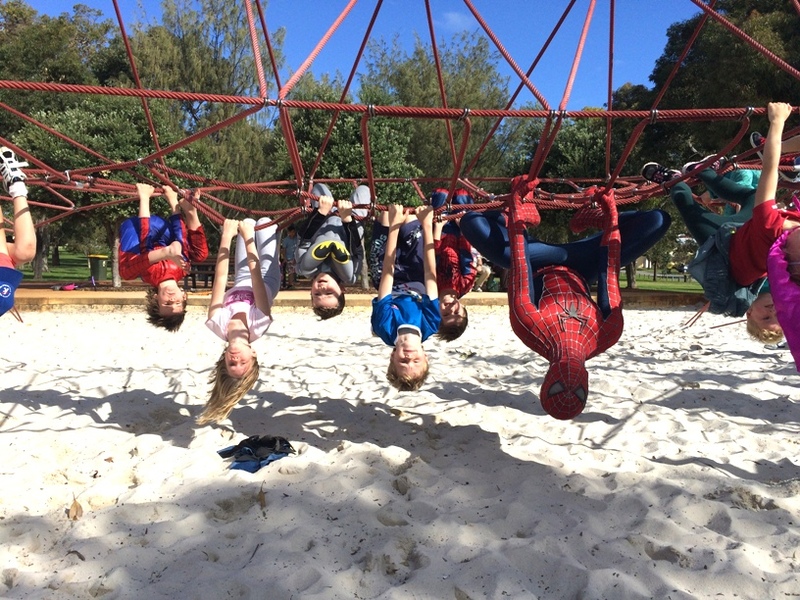 Spiderman cost $300 for 1 hour, the interaction, authentic appearance and personality and photo opportunities for our birthday boy and his friends made it well worth it. 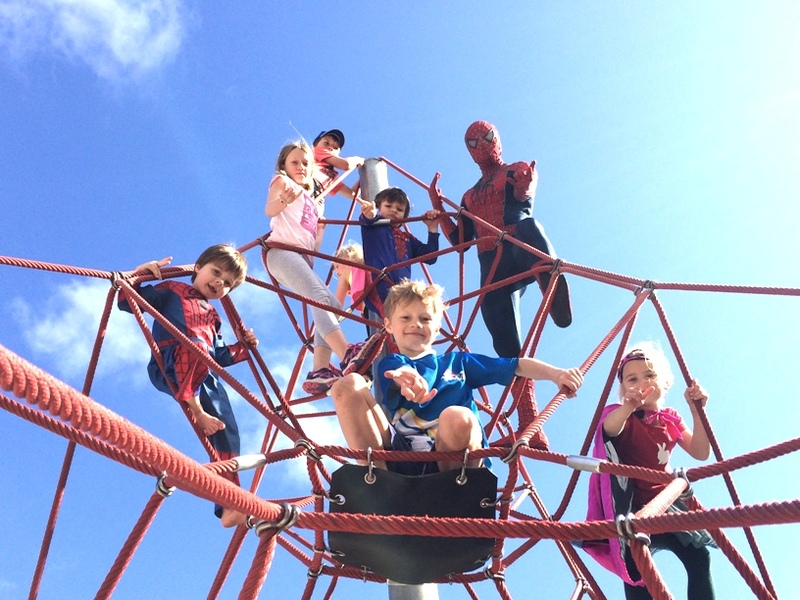 You can also have a combination of characters, just contact Kids Party Heroes to find out more about getting your favourite superhero or superheros at your party or event. 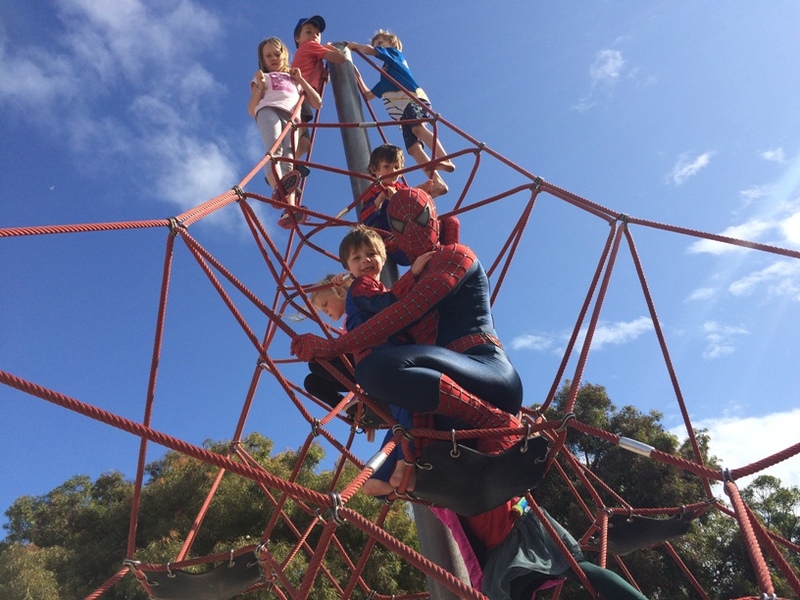 Thanks Kids Party Heroes, weeks later Master 5 is still talking about when Spiderman came to his party and climbed on the big ropes with him and his friends. Highly Recommended.